Production and supply of food crops is underpinned by various factors starting from pre-planting to postharvest farming activities. Productivity of available resources, development of new crop varieties adapted and resistant to multiple agroecologies, crop diseases and other underlying constraints, and the need to design relevant policy interventions required to bring about technical progress in respective sectors and subsectors appear to be the basic structural features of crop research and production in Ethiopia. This study is designed to assess the adoption, production, productivity, efficiency and supply of two major crops widely produced in Ethiopia (wheat and faba bean). It is particularly aimed to analyze and validate (1) major crop production constraints and their incidence, prevalence and intensity of crop damage; (2) production, intensity of input use, adoption of improved inputs, supply and participation in output markets; (3) productivity, efficiency, and underlying sources of efficiency differentials and inefficiency effects among producers; and (4) agricultural innovations, yield gaps, and technical change in wheat and faba bean production. The study makes use of three major sources of data (cross-sectional and timeseries) and primary data (collected form key experts). One of the datasets is Living Standards Measurement Survey (LSMS) obtained from Central Statistical Agency (CSA) collected in 2013/14. It is a socioeconomic survey of about 5262 households operating on about 30000 fields of all crops produced in the country. For this study, data on households, crop fields, input use, crop output, production shocks and crop damage, market participation and supply, and other covariates on 1387 wheat and 475 faba bean fields are considered. Data related to development and release of new crop technologies are obtained from Ministry of Agriculture and Natural Resources (M0ANR). Timeseries data on patterns of production, yield, and supply available at the global database of FAOSTA since 1961 are also utilized. The study has employed methods supposed to be more relevant and rigorous. Systematic review of existing studies undertaken since 2007 in Ethiopia have been critically conducted with rigorous review procedures including formulation of the research questions, identification of relevant publications and their quality assessment, summary and interpretation of the review findings. Analysis and interpretation of secondary data has also been extensively used to allow for empirical support to the review findings. Adoption of improved inputs (seed and fertilizer) for wheat production and the determinant factors thereof are identified by a seemingly unrelated (SUR) bivariate probit model. Market participation and intensity of participation by smallholder wheat and faba bean producers is analyzed by Heckman sample-selection models. Stochastic production frontier (SPF) models with half normal distribution are employed to estimate the productivity of factor inputs used for wheat and faba bean production by smallholder farmers. Efficiency scores are predicted from the frontier models, analyzed across different sets of covariates, and accordingly stylized and documented. Two-limit Tobit model is used to identify the underlying sources of efficiency differentials and inefficiency effects for both wheat and faba bean. Time trend growth model of wheat and faba bean yield is analyzed to estimate the technical change attained in wheat and faba bean production. Gap between attainable and actual yields of new crop varieties is analyzed and compared by their yield performance and resistance to diseases on research stations. The review process and analysis of the datasets have revealed policy-relevant findings. Constraints of wheat and faba bean production are identified and categorized into three as diseases, environmental and pests with their spatial distribution across the country. The incidence and prevalence of crop damage caused by the top ten constraints are identified for both wheat and faba bean crops. Shortage of rainfall, crop diseases, and excessive rainfall were the top three covariate shocks causing crop damage in 2013/14. About 36 percent of wheat fields and 37 percent of faba bean fields were adversely affected by production constraints. The intensity of crop damage was about 35 and 38 percent, respectively, for wheat and faba bean with significant variation across regional states, agroecology and soil type. Use of improved inputs for wheat and faba bean production is found to be generally very low but with considerable difference among regional states and production inputs. On average, only 12 percent of wheat and 0.1 percent of faba producers used improved seed in 2013/14. Though wheat production increased exponentially over the last 22 years, per capita supply of wheat in Ethiopia has undergone substantial downturn, particularly in the last decade. The SUR bivariate probit model outputs of adoption of improved seed and chemical fertilizer have resulted in policy-relevant findings. Adoption of improved seed of wheat by smallholder farmers in Ethiopia is only 9 percent; whereas farmers are more likely to use fertilizer (66%) for wheat production. The likelihood of adopting both inputs for wheat production is very low (7.3%). The probability of farmers in using neither of the inputs is surprisingly high (32.7%). It is worrisome that wheat farmers in Ethiopia are 80.5 percent likely to use chemical fertilizer without improved seeds. The sample-selection model outputs reveal that wheat and faba bean producers in Ethiopia are essentially non-commercial, where only 38 percent of wheat producers and 28 percent of faba bean producers have participated in the output markets, with variation across covariates and constraints. Factors determining market participation of wheat and faba bean producers are also identified. The likelihood of participation of producers in the output markets of wheat and faba bean predicted from the model is estimated at 40 and 33 percent, respectively. The SPF model outputs show that improved seed used for wheat production (o.76%) and labor used (0.49%) for faba bean production are inputs with the highest productivity. The returns to scale in wheat and faba bean production, respectively, are decreasing (0.89) and constant (1.02). The mean technical efficiency of wheat and faba bean producers is about 70 percent of their potential output for both crops, but with substantial variation across regional states, agroecology, soli type and plot slope. The factors contributing to inefficiency differentials among producers of both crops are characterized and the mean technical inefficiency is computed to be 46 percent. Agricultural innovations related to crop production and marketing in Ethiopia are also characterized and analyzed. Until 2016, 74 varieties of bread wheat, 34 varieties of durum wheat, and 31 varieties of faba bean have been released for production Ethiopia. These varieties are characterized by high yield gaps between potential and actual both on research stations and farmers’ fields. The average yield gap in recently released varieties is 36 for bread wheat, 29 for durum wheat, and 75 percent for faba bean. The level and pattern of yield in Ethiopia is compared to top 20 countries of strikingly high yield improvement globally. Ethiopia appears to be 31st in wheat production and 67th in wheat yield. Interestingly, Ethiopia, with surprisingly low yield improvement, however, is the world’s second producer of faba bean in 2013/14, next to China. New and high yielding wheat and faba bean cultivars resistant to diseases are very few in the country. In this study, only 21 varieties of wheat are identified and validated to be resistant to the major wheat disease in Ethiopia (stem rust, leaf rust, yellow rust, septoria, and Ug99). The overall index of resistant to these major diseases is only 39 percent. To the extreme, there only four faba bean varieties resistant to the major faba bean diseases in Ethiopia (chocolate spot, rust, and ascochyta blight). Technical progress attained in wheat production is 2.8 percent per year, which is a cumulative progress of 112 percent in the last 40 years (1975-2014). Technical progress in faba bean production is relatively low (2.2%), a cumulative progress of 88 percent in 40 years period. However, there was 35 percent technical regress in faba bean production in the current policy regime of 22 years (1992-2014), an annual regress of 1.6 percent. In addition to the technical innovations described above, key experts of wheat and faba bean research have validated few other innovations. One of these innovations is institutional innovation on agricultural marketing in Ethiopia, identified to be establishment of the Ethiopia Commodity Exchange (ECX) in 2007. This institutional innovation is thought to be a breakthrough in the performance of agricultural marketing systems in Ethiopia which has been intended to substantially manage risks of operation, credit, market, liquidity, and reputation of all actors. Many crop management innovations are considered new to most of the smallholder farmers in Ethiopia. 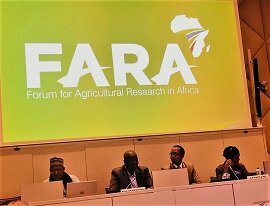 As perceived by key experts of wheat and faba bean research in Ethiopia, adoption of these innovations by smallholder farmers is now getting momentum. These existing management innovations identified by the key experts include (1) treatment of acidic and black soils; (2) use of new seed and fertilizer recommendation rates; (3) row plating; (4) establishment and strengthening of marketing cooperative unions; (5) creation of market linkages between smallholder producers and other market actors; (6) establishment of fertilizer blending centers; and (7) wheat self-sufficiency program initiated by the government. The findings of this study clearly reveal policy relevant implications on the multiple production constraints and their adverse effects, intensity of input use and adoption, yield improvement, productivity, efficiency, and market supply of crop outputs. The results generally suggest the need to characterize and control for production constraints with enhanced development and release of new agricultural technologies adapted to diverse agroecologies and resistant to crop diseases, adoption of existing technical and management innovations, and supply of improved inputs.